Birds are one of the most beautiful and wonderful creation of nature. They are distinct not only in their physical appearance but also in their nature and characteristics. Their chirping is very pleasant to hear. Not only this much, they are great craft artists because they make a strong and beautifully weaved nest for themselves. Because of all these characteristics, people like birds very much. 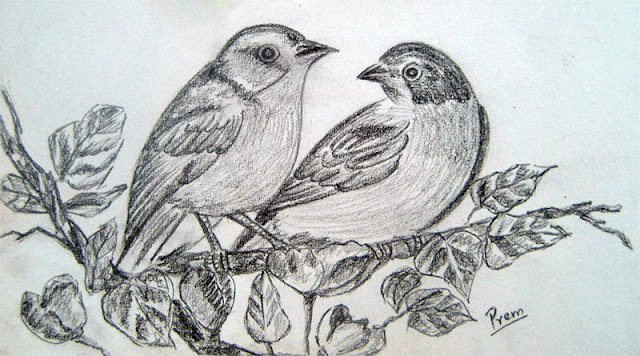 So, I am going to dedicate this post to birds by sharing their sketches with you. 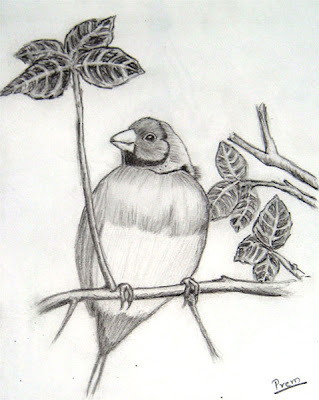 I sketched this bird by looking at the sketch of an illustration of a drawing book as a practice. I had a great time sketching it because of the details I had to consider while drawing it. If you are also learning to sketch then you might give it a try. All the soft details are the attributes of this work. This sketch of an ostrich, the world's largest bird, is also from an illustration book and I had a great time while sketching this one as well. I made the borders to give it a look of a framed photograph. We can add our creativity in every pictures we sketch. What's common in both of these pictures is the utmost care with which both the sketching and the shading has been done and the details have been captured. These couple birds are more recent work of mine. While the above two sketches were done carefully, this one was done in a rough, quick manner. The peculiarity of this work is the variation of tones in the work. Please, don't forget to share your views on the comments below.